Colombia’s former President and Nobel Peace Prize laureate Juan Manuel Santos is a true political insider who has rarely strayed far from the path to the presidential palace. The Santos family have long been considered heavyweights in Liberal politics and the media even before the Republic of Colombia existed. Santos’ great uncle Eduardo Santos was president from 1938 to 1942, while his cousin Francisco was Vice President in the Uribe administration. The family are also associated with Colombia’s leading national daily, El Tiempo. The family were majority shareholders in the paper from 1913-2007, while Santos’ father edited the paper for over 50 years. Santos was schooled in economics in prestigious schools in Colombia, the U.S and England. He began his political career in his early twenties when a friend appointed him a delegate for the National Federation of Coffee Growers in London. After nine years in the role, he returned to Colombia to work as Sub-Director for the family newspaper. After a decade in journalism, Santos was tempted back into politics in 1991 when then-President Cesar Gaviria offered him the post of trade minister. Two years later Gaviria appointed him ‘Designated Official to the Presidency’ – a post that was replaced by the role of Vice President after Santos’ term. In 1994, Santos laid the groundwork for his future presidency when he formed the Good Governance Foundation. Key personnel from the foundation are currently part of Santos’ cabinet while the ‘Third Way’ politics he expounded through the institute has formed the basis for his centrist governing coalition. Santos fell out of favor during the controversial presidency of Ernesto Samper (94-98), failing in his bid for the post of ambassador to the United States. Under Samper’s successor, the Conservative Andres Pastrana, Santos participated in the ill-fated peace process with leftist guerrillas the FARC as a member of the International Accompaniment Commission. However, he soon resigned, complaining about a lack of coordination. He became a strident critic of the government afterwards — at least until 2000 when he was appointed Finance Minister. With the election of Alvaro Uribe in 2002, Santos career was to reach a turning point that would see him break ties with his party and prepare the way to the presidency. At the start of Uribe’s term, Santos was still a leading Liberal with hopes of heading the party. However he fell out with the Liberal hierarchy when the party expelled 15 congressmen for voting in favor of changing the constitution to allow Uribe’s re-election. With the Liberal party divided, Santos was a central figure in the 2005 formation of the breakaway Social Unity Party – better known as the U Party – which united cross party supporters of Uribe under one banner. After Uribe’s re-election in 2006, the president rewarded Santos’ loyalty by appointing him to the key position of Defense Minister, where he was responsible for the military assault on leftist guerrillas under Uribe’s “Democratic Security” policy. The role was to prove the most controversial stage of Santos’ career but one that would ultimately help realize his presidential aspirations. In March 2008, Santos authorized an airstrike on a FARC camp in Ecuadorian territory, which killed leader “Raul Reyes” and 25 others, including an Ecuadorean citizen. Governments in Latin America and around the world condemned the attack as a violation of Ecuadorean sovereignty, while the Ecuadorean authorities severed diplomatic ties with Colombia and Ecuadorean judges brought charges against Santos and other high-ranking Colombian military officials. This was followed in July by the rescue of the kidnapped former presidential candidate Ingrid Betancourt along with three U.S. contractors, seven Colombian soldiers and four Colombia policemen. The intelligence-led “Operation Checkmate” was widely praised for being carried out without a shot fired. Santos’ tenure as Defense Minister was also tainted by the breaking of the “false positives” scandal – the extra judicial murder of civilians who soldiers then presented as guerrillas killed in battle in order to increase their kill count and claim benefits. Although he never accepted his own political responsibility for the practice, in November 2008, Santos admitted it was happening and created a commission to investigate. After it became clear that Uribe would fail in his attempt to again revise the constitution to allow him to stand for a third time, Santos resigned his position in order to stand as the U Party candidate. After seeing off a surprise challenge from ex-Bogota mayor Antanus Mockus, Santos was elected President in 2010 with 69% of the vote in a second round run-off. Santos was elected as a continuity candidate; riding high on the continuing popularity of Uribe he pledged to continue with the incumbent’s key policies, especially Democratic Security and the military offensive against the FARC. However, Santos soon began to distance himself from Uribe. He replaced his predecessor’s hardline rhetoric with a more inclusive approach, improving the government’s relationship with previously ostracized groups such as human rights workers and even reaching out to neighbours Venezuela, who had enjoyed a fiery relationship with Uribe. He also began to replace Uribe’s political allies in key government positions, surrounding himself with his own people. 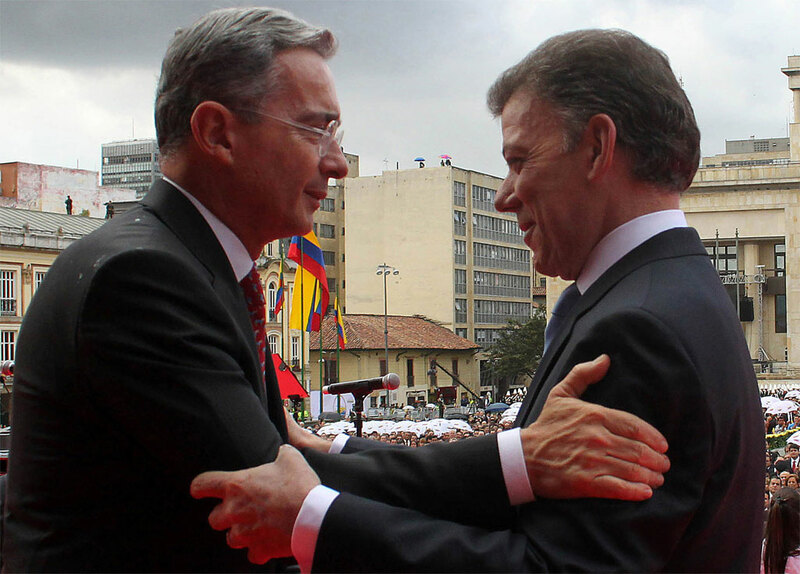 The relationship between Santos and Uribe began to publically sour as the two fell out over Santo’s handling of security and the conflict and over Santos’ increasingly centrist policies, including his flagship land restitution policy, the Victims Law. Approaching the end of his first term however, there would no mistake as to what split the two political powerhouses apart the most: peace talks with the FARC. 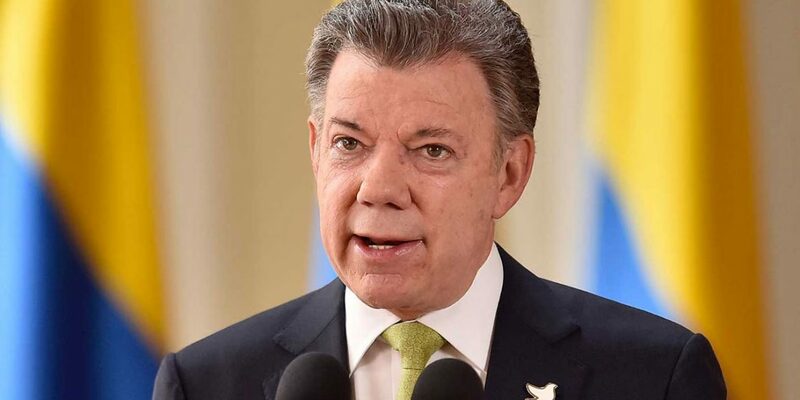 In August 2012, President Santos said that he had been exploring the idea of engaging in the fourth historical attempt at peace talks with the FARC (the past three occurring in 1984, 1990, and 1998), and Uribe and many conservative “Uribistas” were enraged at the prospect. Peace talks threatened the legacy of Uribe, who had built his career around fighting the guerrillas mercilessly, and went against the “continuity candidate” premise that Santos had run on two years prior. 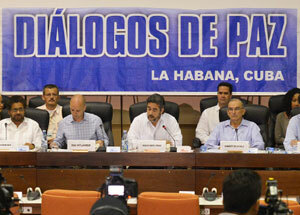 In November 2012, the peace talks officially began in Havana, Cuba, and the government and the FARC sat down to discuss a six item agenda including agrarian reform, political participation, and an end to Colombia’s 50 year old armed conflict. While Colombians had a mixed feeling about the prospect of dialogues with the FARC, Santos ran into other problems in 2013. In mid-August, several sectors of Colombia went on strike against the government citing a number of different problems mainly rooted in a lack of promised attention or financing by the government. Health workers, coffee farmers, truckers, university teachers, university students, rice growers, sugar cane cutters, and miners all decided to go on strike within just two months, and in many ways the nation came screeching to a halt. Schools were closed, roads were blocked, crops were left unattended, and Santos scrambled to appease each sector to get Colombia up and running again. At the end of November, 2013, a day after the one year anniversary of the beginning of peace talks with the FARC, Santos announced his reelection aspirations, and in January 2014, his campaign began with the U Party officially endorsing him as their candidate. Santos barely won the 2014 elections from Oscar Ivan Zuluaga, the candidate endorsed by Uribe. The opposition candidate won the first round, but was forced to admit defeat after a coalition of political parties in favor of the peace talks decided to endorse Santos for the second round. Santos at that point became the second president ever to enjoy a second consecutive term. The peace talks with the FARC were successfully finalized in August 2016 after four excruciating years of negotiations that faced fierce opposition from Uribe. Santos was awarded the Nobel Peace Prize in September that year, just after a referendum rejected the initial deal by the narrowest of margins. However, emboldened by the international recognition, Santos was able to negotiate a revised peace deal ahead of the Nobel ceremony in December. Santos left office on August 7, 2018, when he handed over executive power to Ivan Duque, a former protege who had joined Uribe’s Democratic Center party. The former president has since been teaching at Harvard University in the US and has largely remained out of the public light.